British sprinter Jonnie Peacock beat American rival Richard Browne to add a world title to the Paralympic gold medal he won at London 2012. 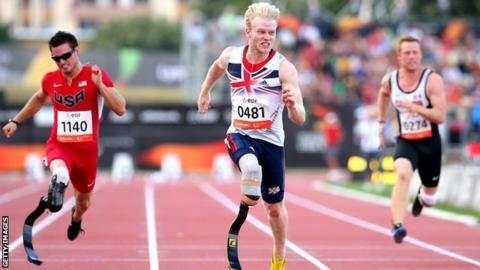 Peacock overcame a stumble at the start to win the T44 100m final at the IPC World Championships in 10.99 seconds. The 20-year-old finished 0.02 secs clear of Browne, with reigning champion Jerome Singleton third in Lyon. Browne had beaten Peacock's single leg amputee world record of 10.85 by 0.02 secs in Monday's semi-final. "The last few days have been stressful but I came here to get a job done," Peacock told BBC Sport. "I didn't execute the start how I should have done and he got a couple of steps ahead of me, but from then on it was just head down and push and get to the line. "At the end I thought I had won, but it was close. For the last 20m I just had to relax. I knew if I did that I would go faster." Browne, who had been vocal on Twitter in the build-up to the race about his rivalry with Peacock, was visibly annoyed and initially left without speaking to the media before returning a few moments later to pay tribute to the winner. "That was a phenomenal race and performance from Jonnie. After the semi-finals, my heart said he would win, but my head said Browne. Then the guys were on the track for a long time ahead of the race and the music was playing and you saw Browne expending all of his energy, dancing and cheering at the crowd while Jonnie just sat on his blocks looking up the track. At that point, Jonnie looked like the winner. He did stumble out of the blocks, but to be that composed under a lot of pressure - coming here as favourite and losing his world record - was fantastic." "It was such a close race, it was a great race. I tried to dip at the line but he got me and I can't complain," said the 22-year-old. "I've only been an amputee for three years, and on the track for one year, so I can't be upset with myself." Peacock, who finished sixth at the last World Championships in New Zealand in 2011 before grabbing gold in London, hit back at Browne's Twitter remarks. "It is about finals at the end of the day," he added. "I don't understand all this talk, where you talk about it before. It's about whoever wins the race, then you can start talking." The pair are set to meet again on Sunday at the London Anniversary Games in the Olympic Stadium, where they could also be joined by Brazilian double amputee Alan Oliveira, who won gold in his event on Tuesday, the T43 100m. The Brazilian triumphed in a time of 10.80 - just outside the 10.77 world record he set in Berlin in June - to complete the 100m and 200m double. Earlier, Richard Whitehead and Aled Davies won golds for Britain in the T42 200m and F42 discus respectively. Whitehead had a poor start but stormed through late on to win in 24.79 seconds, ahead of Australia's Scott Reardon (25.29). "That was the hardest last 50m I have ever done," said the GB team captain. Whitehead broke one of the feet of his prosthetic legs while training last week and was also suffering from a quad muscle injury in the build-up to the race. "It was tough today but the support was great," he added. "It was all about crossing the line first. I dug deep and at one stage it was about how much I really wanted it and I wanted it more than the others. "I just wanted to show that a 37-year-old can still be a competitor." In the morning session, Davies, who won shot put gold on Sunday, looked out of sorts early on with fouls in his first two rounds. But he regained his composure and threw 47.62m in the final round to win by over six metres. "I didn't make it easy for myself but to come away as a double world champion is a good week's work," he said. "It was a tough competition and I wanted to start with a big throw because I knew I was in good shape but I won in the end and that is all that matters. "I had to make a standing throw just to make the cut and once I threw 43.51 in the fifth round I knew I was safe and it wasn't bad to come away with the second-longest throw of my career in the last round."